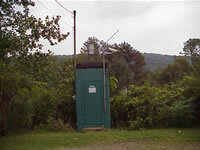 LOCATION.--Lat 41`28'54", long 79`41'44", Venango County, Hydrologic Unit 05010003, on right bank 100 ft downstream from bridge on State Highway 8, about 300 ft upstream from Cherrytree Run, and 1 mi north of Rouseville. Records include flow of Cherrytree Run. PERIOD OF RECORD.--June 1932 to current year. GAGE.--Water-stage recorder and heated tipping bucket precipitation gage. Datum of gage is 1,028.32 ft above National Geodetic Vertical Datum of 1929. Prior to June 9, 1941, non-recording gage at same site and datum. COOPERATION.---Station established and maintained by the U.S. Geological Survey. Funding for the operation of this station is provided by the U.S. Army Corps of Engineers, Pittsburgh District, the Pennsylvania Department of Environmental Protection and the U.S. Geological Survey. REMARKS.-- The 15-minute precipitation data for this station are temporary and will only be displayed for 120 days. Time series of 1-hour or cumulative daily values will NOT be available for retrieval following the 120-day display period. Although the instrumentation is calibrated at least once a year, the temporary classification means that documented routine inspections and other quality assurance measures are not performed that would make the data acceptable for archival, retrieval, or future use in general scientific or interpretive studies. Supplied by NWS: Flood stage-11 ft; Moderate flood stage-13 ft; Major flood stage-15 ft.